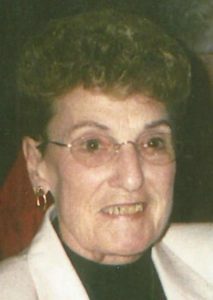 Grafton – Janice C. (Reed) Wenc, 88, passed away Monday, May 9, 2016 at Beaumont Nursing and Rehabilitation Center in Northbridge following a valiant battle with Lewy Body dementia for the past four years. She is survived by her husband of 69 years, Chester “Chuck” Wenc; her sons, Rodney Wenc and his wife Donna and Ronald Wence and his wife Lee; daughters, Candace DuBrino and Bonnie Donovan and her husband Sean; grandchildren, Erich Wenc and William and Rachel Wence,; four great-grandchildren; and several nieces and nephews. Her brother, Raymond “Bib” Reed, and sister, Carol LeClaire, predeceased her. Janice was born Jan. 3, 1928 in Millbury, where she grew up. For many years she and her husband Chuck lived in Grafton, where they raised their family. Janice worked for Shaw’s Supermarket for many years in Northbridge, where friends old and new would look forward to seeing her. Her family would like to thank the staff at Beaumont Nursing and Rehabilitation in Northbridge and Salmon Hospice for their compassionate care of Janice. Please honor Janice with a memorial donation to St. Jude Children’s Hospital, 262 Danny Thomas Place, Memphis, TN 38105 or online at www.StJude.org. All are welcome to a prayer service for Janice Saturday, May 14, at 11 a.m., at St. Phillip’s Cemetery in Grafton. There are no public calling hours. To share a memory of Janice or leave a message of sympathy with her family, visit www.RoneyFuneralHome.com.